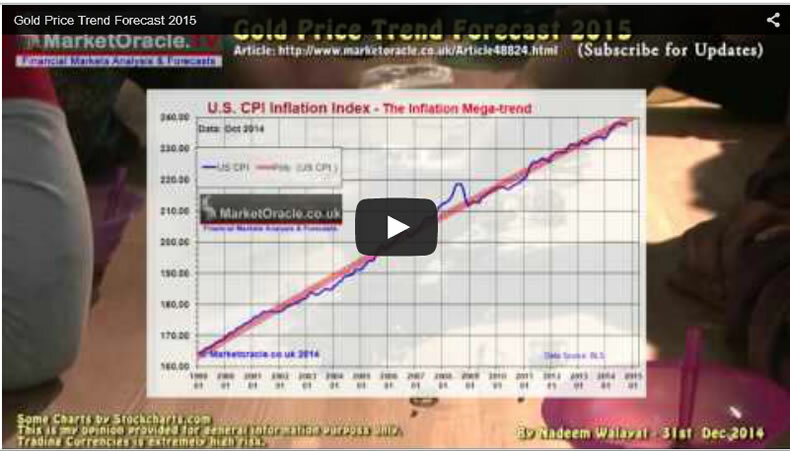 Gold Price Crash - Trend Forecast 2015, Gold Stocks Buying Opportunity? The gold price bear market has continued in 2015 since its mid January 2015 peak of $1307 that had fooled many gold bugs into assuming that the preceding multi-year bear market was finally over and that 2015 would see a strong price rally to possibly even new all time highs! However, so far 2015 has seen a series of failed rally's rolling over into downtrends to new lows, punctuated by flash crash days such as that which took place on the 19th of July that saw a series of flash crashes that lasted no more than a couple of seconds that took the gold price to well under $1,100, to a new five year low of $1080 before recovering to currently stand just over $1,100. The latest slump in the gold price continues to show how detached the gold bugs are been from reality for the whole of this year every dip in price has been accompanied by highly vocal calls for an imminent bottom and new highs. For instance when I last wrote about Gold in March warning not to get suckered into widespread Gold bugs wishful thinking, which at the time was obsessed with statements that Apple was about to buy as much a 1/3rd of the global gold supply for its new i-watch that would soon push the Gold price to new all time highs, which since the Gold price soon resumed its bear market trending now a new low of $1080 (Gold Price Bull Market 2015 Annihilated by Strong U.S. Dollar). As ever there is no need to look too far for the real culprit, not for the flash crashes but the over-riding bear market trend which is the US Dollar that has continued to levitate at multi-year highs despite all of the reasons put forward by perma dollar doom merchants for its imminent collapse. I'll take a look for the prospects for the US Dollar for 2015 in a separate article, however as my original USD forecast excerpted below illustrates that the current USD index of 97 is virtually exactly where I forecast it would be by now over 7 months ago. My USD Trend forecast conclusion for 2015 is that after the current correction is over by around USD85, that the USD then trends higher towards a target of 98 by mid summer 2014, probably terminating in a spike to just above 100 before correcting back towards 92 by the end of the year as illustrated by the following trend forecast graph. In terms of my forecast expectations for the gold price than I refer to my analysis of last December that concluded in the following trend expectation for 2015. For what happens next, I could literally cut and paste what I wrote on the 13th of March 2015 (Gold Price Bull Market 2015 Annihilated by Strong U.S. Dollar). The most recent gold price close of $1,152 compares virtually exactly with the forecast trend trajectory for 13th March 2014 of $1,155. Therefore I see no reason to conduct any significant new analysis at this point in time as the forecast trend trajectory strongly implies that the main trend for the Gold price should be one of continuing to trend lower to at least $1050 during July / August 2015. However, in the short-term probability favours a bounce of sorts so as to unwind the relentless 7 week downtrend off of the $1,130 to $1,150 support area that could propel the gold price back towards $1,200, though probably failing to reach $1190 before once more succumbing to the main bearish trend and thus a BREAK of the $1,130 to $1,150 support area. The gold price is showing NO deviation from the trend forecast of over 6 months ago, as in time and price the gold price is homing in on my long-standing forecast low of $1050 by early August. That should set the scene to propel the gold price to over $1,300 THIS YEAR. Therefore I see no reason to conduct an in-depth analysis of the gold price at this point in time, unless I start to see a serious deviation in trend. All that I will add is that the actual low may include a short lived panic spike to just below $1,000. If you have been short this year either through following my analysis or that of your own, then I think now is a good time to start winding down short positions, and tightening stops. Though don't jump the gun and buy for that you need BUY TRIGGERS, i.e. you don't try and pick bottoms even if you think your analysis is spot on, for the market punishes arrogance which means traders can STILL lose even if they get the direction right. Whilst gold bullion investors have worried over Gold's 10% slide this year, gold stock investors must be weeping as the HUI Gold bugs index illustrates a 32% WIPE OUT! Wait it gets worse, for extend the chart out a couple of years and the loses double to 60% for Gold stock investors, and similarly the 3 year chart extends to a near 80% LOSS - OUCH! That's what happens when one bets against a bear market. In terms of what to do I again refer to my original analysis that suggested accumulating Gold bullion and stocks as it moves into its window for a bottom by early August, and given the degree of devastation having taken place in gold stocks, far beyond that suggested by the gold bullion price which thus IS perking my interest, in fact as I write I'm finding myself in the mindset of 'Billy Ray Valentine' of 'Trading Places " BUY, BUY, BUY" from panic selling gold stock holders. And before asking for stock picks - Note I don't tend to give stock picks and especially for the smaller cap stocks for the obvious reason that investing in stocks is very high risk. Look even a supposedly safe blue cap giant such as BP can have a blowout and then there is the total wipe out of bank stocks shareholders. So unless you really know what your doing, even if you get the market fundamentals right, investing in the small, medium AND large cap stocks can still wipe you out! This also begs the question what money are the perma-bull gold bugs going to buy stocks with? Because surely if they had bought their calls for the duration of the slide this year alone, never mind during the preceding years, then they would already have bankrupted themselves several times over by now! The clear investing strategy for 2015 will be for one of accumulating into Gold during first half weakness, as ultimately the Gold price will break out to new all time highs, remember that we live in exponential money printing financial universe, it's just that 2015 or 2016 won't be Gold's years, but who knows 2017 may be the year that the long wait for Gold bugs will finally be over. In terms of exposure, well I have never been a gold bug so my thoughts in terms of exposure are along the lines of 2-3% in a mix of ETF's such as GLD and physical bullion. However that is probably because we have just come through another non Gold friendly year whereas a Gold friendly year, one in which the Gold price soars as many gold bugs hope for would ironically demand greater exposure to gold due to how bad things will have become in terms of holding other assets such as Bonds. 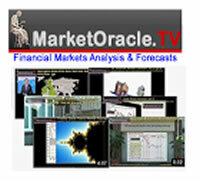 So how much gold to hold is not clear cut and depends on the state of ALL markets. And even then it depends on which assets one already holds i.e. 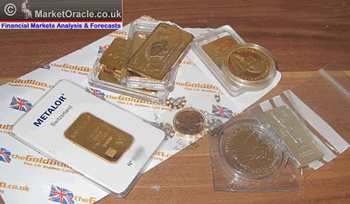 asset classes that are most distant from gold in terms of ability to be printed so if you have virtually all of your wealth in cash in the bank or bonds then you need to own a lot of gold, perhaps 15%, off course if your 100% in cash then it would be wiser to diverse across a range of asset classes rather than plunge heavily into just gold. Whilst if most of ones wealth is in property then 2% or 3% should suffice. At the end of the day I view gold exposure in terms of insurance for what drives the gold price higher (inflation & uncertainty) tends to be bad for ordinary people. And what tends to result in run away bull runs (financial crisis) tends to be very bad! So all those praying for a gold bull run to the likes of $5,000 may regret the world they are living in that delivers Gold priced at $5,000. Much as the religiously infected amongst us who crave imminent armageddon so that they may ascend into paradise.